Melchor Access’ fully IRATA trained and certified technicians specialise in managing complicated access issues for our commercial clients. We also provide access solutions for the mining and resources sector, to find out more visit our mining page. Our mix skilled team of industrial rope access technicians are specialists in managing height and confined space access issues for our clients across a diverse range of construction, demolition and maintenance projects. Backed by Melchor’s ISO Certified safety, quality and environmental standards, our team members are qualified and experienced in all access methods allowing them to apply the most efficient work method to each task. Whilst we specialise in rope access, our experienced technicians are qualified in multiple access methods allowing us to always recommend the best and most cost-effective approach for each project. In addition to rope access, we offer support and technical capability around scaffolding, rigging, mast climbing scaffolds, elevated work platforms (EWP’s), swing stage platforms, building maintenance units (BMU’s) and many other access technologies. Our diverse skill set offers you maximum flexibility and enables us to help you deliver complex commercial projects on time and on budget. In partnering with us to deliver access solutions, you can choose to take advantage of one or more of our project delivery disciplines, from design right through to all facets of construction and maintenance. In addition to access, Melchor’s highly trained teams specialise in electrical, mechanical, hydraulic, fire and civil concreting services. Click here to learn more about our other departments’ capabilities. to the highest standards and with minimal disruption to your facilities and day to day activities. Melchor Access’ operations are conducted strictly according to The International Rope Access Trade Association’s (IRATA) International Code of Practice (ICOP). The ICOP stipulations form a framework specifically designed to internationally mandate safety and quality best-practices around rope access operations. 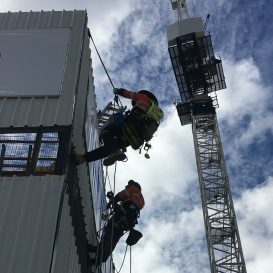 This framework has resulted in exceedingly low levels of safety incidents globally and it is significantly more stringent than many of the outdated Australian Standards governing the rope access industry here. All Melchor Access staff, ranging from Management to Trade Assistants, are IRATA certified rope access operators. Melchor Access has worked on a diverse range of ventures from small, residential maintenance projects through to complex, commercial remediation projects. Our experience delivering projects across a multitude of industries, including defence, industrial, hospitality, renewable energy, retail, residential, transport, marine and offshore oil and gas ensures we can customise access solutions for projects of any size and complexity. Melchor Access’ highly trained, IRATA Certified rope access technicians employ the latest, innovative technology to deliver rope access solutions for the construction, service and maintenance industries. 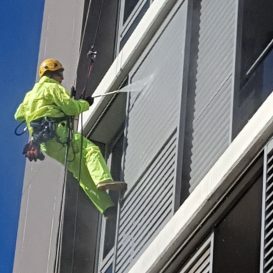 Our experienced rope technicians offer various trade qualifications and have successfully completed a diverse range of work scopes including high-rise inspections, water proofing, glazing, cleaning, repairs, signage, demolition, electrical works, mechanical works and painting. Melchor Access offers a safe, efficient and cost-effective way to perform a variety of tasks in both height and confined-space environments on commercial and residential buildings and industrial facilities. Melchor Access provides end-to-end scaffolding services including design, delivery, installation and removal, all managed within our strict quality and safety systems. We employ the highest quality scaffolding equipment and rely on our experience across a diverse range of sites to ensure your project is delivered safely, promptly and cost-effectively. From residential maintenance and constructions through to complex, commercial projects, we offer high-quality, light-weight Layher scaffold systems as well as heavy-duty systems for a range of applications. Melchor Access offers rigging and specialised lifting solutions for complex commercial projects of any size. We design and install fully customised solutions which can be supported by our rope access operations as required. We also provide teams of fully qualified and experienced rigging technicians and dogmen to seamlessly complete all manner of high-risk work scopes. We employ the highest quality equipment and rigorously inspect all equipment prior to installation ensuring safe and efficient completion of every project. We offer customised swing stage platform solutions to enable streamlined and efficient completion of high-rise construction and maintenance tasks. Exceeding the most stringent safety standards, our swing stage platforms can deliver considerable cost-saving benefits by reducing the time involved to complete work at varying heights. Melchor Access offers design, installation and operation of swing stage platforms as a stand-alone service or as part of our complete scaffolding and rope access capabilities for projects of all sizes. BMU’s (building maintenance units) and EWP’s (elevated work platforms) allow for lateral, horizontal and vertical movement, considerably reducing the time involved to access all surfaces of a structure and therefore delivering significant cost savings. Melchor Access operators are highly skilled in the use of these access systems and matching the right product to the work requirements. We’re also experienced in supplying access alternatives to combat the limitations of these devices. From one-off, low-level projects through to long-term, high-rise work scopes, we can operate, manage and maintain the highest quality access systems to suit your facility and work scope. Located in Perth WA, Melchor Access is a division of Melchor and provides stand-alone access solutions to commercial clients managing projects complicated by height or confined space. Melchor Access was born out of the need to solve the many complex access challenges we faced when undertaking our own commercial contracting services. Seamlessly combining our available trade skills, experience with rope and other access capabilities and commitment to excellence in our field led to increased demand for our access services from other contractors, as well as from our own commercial clients. In addition to rope access, we deliver tailored solutions which incorporate a variety of access methods including scaffolding, rigging and EWP’s. We strive to maintain a flexible and client-centric approach which ensures we’re able to tailor our services to each client’s needs. From access system installations through to complete project management of construction or maintenance tasks with access complications, we’re able to offer as much or as little help as each client needs. With mixed skill teams of trade-certified access technicians, we specialise in construction, maintenance, inspection and repair of commercial buildings and industrial facilities. 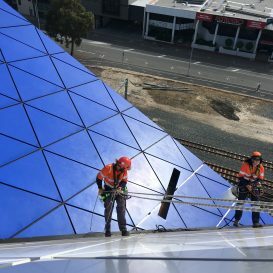 Since its inception, Melchor Access has provided high-rise cleaning, construction, electrical, waterproofing, signage, maintenance and ventilation services at some of Perth’s most iconic buildings. Melchor Access strives to be the industry contractor of choice for high-risk and technically demanding projects, providing an innovative and integrated approach to delivering quality projects through our teams of highly qualified and committed people. We believe in building great relationships, forming strategic partnerships and working with others to achieve positive outcomes for all parties involved. Our commitment to operating with honesty and integrity, whilst delivering the highest levels of service, is fostered throughout our organisation and reflected by all our team members. We adopt a positive and flexible approach to everything we do, ensuring we’re able to provide tailored solutions for every client, regardless of their project’s size or complexity. We maintain rigorous standards of quality and safety which are continuously evaluated and improved upon. We are committed to providing safe, efficient and cost-effective solutions to even the most challenging of access tasks. Our Board of Directors consists of an experienced and talented group of individuals, each adding unique and complementary skills to the management team. Operationally, Melchor Access is led by co-Directors, Patrick McCormack and Shane Jones. Patrick is a Level-3 Rope Access Operator and Manager with over 12 years’ experience in the Technical Height Safety and Rope Access Industries across Australia and internationally. His roles have encompassed the design, manufacture and certification of height safety equipment and included Supervisor, Technical Expert – Advisory Services and Project Manager on high-profile projects around Australia. Patrick’s technical expertise has been regularly used by some of Australia’s largest companies in managing high-risk and restrictive access operations. Shane brings with him extensive experience managing mission-critical projects and the expertise to balance the requirements for functionality, quality, economy and timeliness. His experience includes management and directorship positions across a range of industries including at Hoperidge Capital investments, Hoperidge Engineering and Enerdrill. Shane also holds current director positions at Perth Energy and Merredin Energy. Melchor’s other board members include Jon Biesse, Scott Jones, Craig Burton and Tim Wise who contribute extensive operational, leadership and commercial expertise from a diverse range of industries including from the energy, engineering, resources and finance sectors. In addition to its board, Melchor also benefits from key strategic and financial input from individuals and organisations recognised as standouts in their field. This includes financial backing from Hoperidge Capital which holds key investments across the energy, retail and technology sectors and takes a hands-on approach to ensuring successful operation of its investment businesses. At Melchor Access, the health, safety and well-being of our staff, clients and site visitors are at the heart of everything we do. Specialising in high-risk operations, we maintain and continuously evaluate a rigorous safety system that relies on proactive and innovative techniques to ensure everyone involved in our projects works safely and finishes each day healthy and free of injury. We have a safety-first policy across all our divisions and impose a zero-tolerance approach to any risky behaviour. All team members engage in ongoing training and site-specific safety inductions to ensure well-being is continuously kept top of mind throughout every project. Workplace safety is ingrained in our DNA and our ISO Certified safety systems are meticulously documented to identify and prevent possible risks. Our strong safety culture embraces industry best practices and is one of the key reasons we are trusted by some of Perth’s highest profile developers to deliver project solutions in high-risk environments. At Melchor Access, we are committed to preserving and enhancing, not only the environments in which we work, but also the environment in general. Endorsed by our ISO Certification in Environmental Management Systems, our goal is to avoid causing any negative and irreversible impact on the community and/or natural habitat in which we operate. We aim to be the industry leader in promoting environmental responsibility, respecting our ecosystems and delivering our work processes accordingly. We empower our people to be the best environmental citizens they can and actively encourage each individual to implement sustainable practices. We audit and evaluate our processes on an ongoing basis to ensure environmental best practice is maintained. We also champion innovative thinking and encourage all team members to actively participate in the continual improvement of Melchor’s environmental credentials. Due to the facility’s BMU being unavailable, our team were requested to complete the external lighting component of the Westin Hotel construction project. Our team was able to mobilise quickly and deploy Melchor Access’ IRATA Certified electricians to complete the project within a very short timeframe. Our team were successful in eliminating potential defects and relied on innovative thinking as well as technical trade skills to solve facade compatibility issues. Our client had been experiencing water ingress issues through the concrete and brick facades on the upper levels of their 10-storey facility. Upon our inspection, it was evident that excessive cracks and penetrations were the primary causes of this issue and had also contributed to degradation of the paint and water-proofing systems. 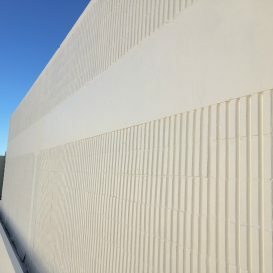 The Melchor Access team was able to safely access and repair the structural defects as well as apply a waterproofing coating system to the facade. This project was completed with a very high level of client satisfaction and with minimal disruption to the tenants. Melchor Access has considerable signage installation experience which we recently relied upon to complete a series of signage installations on the jump forms of one of Perth’s major construction projects. Our extensive experience in electrical and mechanical projects, as well as our available trade skills, is of great advantage to our clients when installing or repairing commercial signage systems. Our client was experiencing issues with the previous access method used at their facility which resulted in continual excessive costs and maintenance difficulties. Melchor Access was successful in designing and delivering a complete overhaul in the form of our “Access Maintenance Package”. This included installation of a new access system to provide safe and efficient access to the facility’s facade as well as an annual maintenance package consisting of a full facade clean, window clean and anchor system inspection and certifications. The client was so happy with the resulting cost and efficiency savings, they have since engaged us to provide similar services across their other facilities. Our client had been experiencing exhaust issues within their building when the facility’s backup generators where engaged. Upon our inspection, we identified that the exhaust system lacked sufficient length to clear the riser shaft and, as a result, other ventilation outlets were drawing exhaust fumes into the facility. Melchor Access was able to design, manufacture and install a new exhaust system that sufficiently cleared the riser shaft and eliminated exhaust fumes entering the facility. 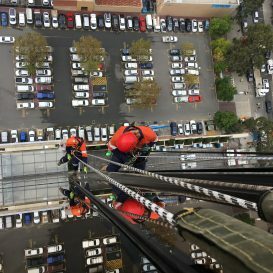 This task involved the successful management of high-risk operations such as rope access, confined space operations, isolations, hot works and advanced rigging techniques to complete the project without the use of cranes and street closures. The project was completed on time, within budget and to a high level of client satisfaction. Melchor Access has a dedicated and experienced team of rope access operators with various trade skills and capabilities. One of our services is managing water ingress issues which we undertake for many clients, including BGC Maintenance, Ramsay Health Care and Colliers International, on an ongoing basis. This challenging and common problem across many of Perth’s facilities requires a high degree of problem solving and the use of different trade capabilities to manage effectively. Our ongoing high access waterproofing contracts are testament to the high success rate we deliver in efficiently identifying and managing problem areas. 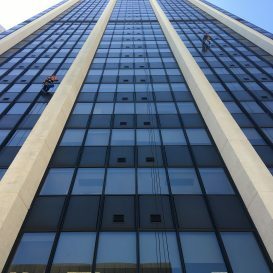 Melchor Access’ team of IRATA certified rope access operators are responsible for maintaining and cleaning windows at some of Perth’s most iconic buildings. Utilising a combination of rope access, building maintenance units and elevated work platforms, our team provides the highest quality results delivered in the safest and most cost-effective manner. Whilst we enjoy the unique challenges presented by maintaining some of Perth’s taller assets, we also utilise our multiple access methods to maintain small to medium size facilities which also commonly struggle with safe access and maintenance. I can say that Melchor Access are the most professional and open Rope access company I have dealt with since being at BGC for the last 10 years, they have people whom understand what is happening and the know how to fix the problem, not cowboys. I would recommend them to everyone. Melchor have gone above and beyond to help us deliver a particularly challenging project with multiple stakeholders. They have provided an exceptional level of customer service, rigour and attention to detail. We look forward to engaging them on future projects. Melchor are one of our favourite contractors to deal with! They are always prompt and attentive to our requirements. They go over and above to achieve the results required and are happy to provide additional information and assistance to allow us to more easily explain situations and technical aspects to our clients. Their communication and reporting is above the norm and I would not hesitate to recommend this company to others. Having worked with Patrick and the Melchor team on various significant projects their level of preparation, professionalism and project execution is exactly what we seek. We look forward to continual mutually beneficial relations for decades to come. The Team at Melchor were highly recommended to me by a colleague and when given the opportunity, went above & beyond expectations to deliver premium quality service & workmanship as well as out of the box thinking when accessing difficult to reach areas .Thank you & I look forward to working together in the future. Melchor have recently completed a complete cleaning of the extremities of our buildings, both Q1 and Q2, two large residential complexes. 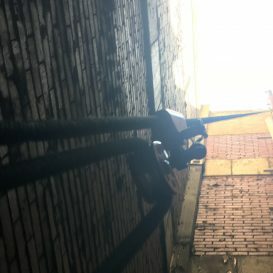 Neither of the buildings had been cleaned since they were built. They troubleshot complex problems to complete the job and presented our buildings in pristine condition, I could not recommend Melchor highly enough. Melchor Access specialises in simplifying high risk operations with our mixed skilled teams. We utilise methods of access along with our IRATA Certified rope access technicians and varying trade certifications to complete a range of work scopes.